Photo: Kadir van Lohuizen, Amnesty International. 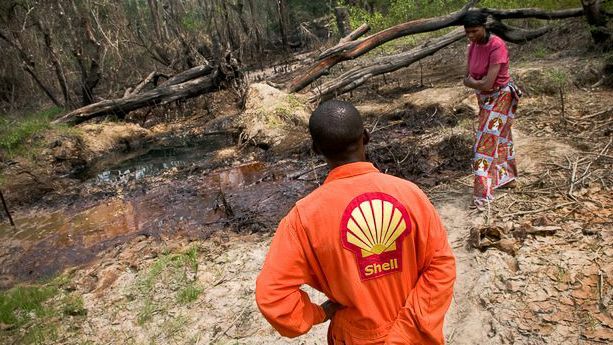 After years of struggle, Shell is finally being held legally accountable for the damage it has caused in the Niger delta where it is estimated up to 10 million gallons of oil has been leaked. A class action lawsuit originating in London forced the Dutch oil giant to accept full responsibility for the 2008 ruptures of the Bodo-Bonny trans-Niger pipeline. Together the Ivorian community and a London law firm have forced the energy company to take responsibility for its actions. This precedent is cause for great celebration. However, one thing this law case cannot accomplish is to undo the decades of social and environmental injustice caused to the Niger Delta’s communities and natural environment. Whilst a wrong is being redressed it appears that the law is being used reactively. It will be decades before the Niger Delta is returned to anything like it used to be. This highlights how we also need something proactive, something that pre-empts the large-scale destruction of the environment and stops it from happening. In essence, we need to make such human-made catastrophe illegal. Ecocide is defined as the “extensive destruction, damage to or loss of ecosystem(s) of a given territory, whether by human agency or by other causes, to such an extent that peaceful enjoyment by the inhabitants of that territory has been severely diminished”. Polly Higgins, international environmental rights lawyer and barrister, is proposing that ecocide be recognized as the 5th Crime Against Peace in the United Nations. This would place ecocide alongside genocide, war crimes, crimes against humanity, and crimes of aggression, and therefore punishable in the International Criminal Court. Criminalising ecocide is a preventative measure that will ensure company CEOs, heads of banks and heads of state will not conduct business, finance, or support activities that could result in ecocide, for if they do, they could face prison time. The Eradicating Ecocide campaign, also suggests that ecocide be a crime of strict liability. This means that to convict someone of ecocide all that needs to be proven is that they caused it, regardless of whether they had intended to. In the case of Shell, it is unlikely that the company actually set out to destroy the Niger Delta. Rather, they set out to make profit and in the process abdicated their responsibilities in a monumental way. The large-scale destruction of the environment is already illegal during wartime. The 1977 Environmental Modification Convention sets out the criteria for measuring the destruction; it must be of a certain size (over two hundred square kilometres), duration (over a season) and impact (involving serious or significant disruption or harm to human life, natural economic resources or other assets). The Convention was agreed to by the member states of the UN in part due to the use of Agent Orange during the Vietnam War, the devastating and long-term effects of which were clearly in excess of the wartime advantaged gained. By criminalizing such acts on an international scale a direct disincentive was put in place. As a result, environmental modification techniques have been used significantly less during wartime (e.g., chemical weapons). Higgins’ suggestion is simple; that we ensure ecocide is criminal during peacetime as well as wartime. The campaign believes that this law is neither anti-corporate nor anti-profiteering. It is about stopping activity that is damaging and halting profits that arise from illegal plundering on a mass scale. It is about corporations taking responsibility. Looking towards the future, this law has the potential to open our eyes to a new form of earth governance. One where the earth is not treated as an inert, lifeless entity to be commoditised, exploited, and traded. Instead the earth will be seen as a living, breathing being recognized for its intrinsic value and treated with compassion and responsibility. Our current business strategies put profit before all else at the grave expense of the world’s ecosystems. However, in one bold move the criminalization of ecocide can ensure that the destruction of the earth is no longer profitable. This transformation has the potential to level the international playing field and ensure corporations can look towards more sustainable business opportunities. Since the Ecocide campaign began over a year ago more and more people are speaking out and taking action against a system that exploits the earth and its inhabitants. For example, a group of teenagers (of the group iMatter) teamed up with a group of lawyers to take the United States government to court over its failure to protect the atmosphere. The aim of such lawsuits is to have the atmosphere declared a ‘public trust’ deserving of special protection, a concept previously used to clean up polluted rivers and coastlines. And at the time of writing this article, an international network of NGOs, businesses, and campaigning groups are speaking up against the numerous human and environmental rights abuses taking place in the Athabasca Tar Sands. These abuses include the polluting of the Athabasca River, the pollution of the air with toxins, and the gradual destruction of farmland. Meanwhile, First Nations communities are suffering from unusually high levels of rare cancers and autoimmune diseases and their traditional way of life is being constantly undermined. Opposing voices include those of the Beaver Lake Cree (indigenous to Athabasca), the Co-Operative, Lush cosmetics, 350.org, Avaaz, Greenpeace and many more. These are but a few examples of people around the world standing up to the irresponsible destruction of our planet. Furthermore, the Eradicating Ecocide campaign is also gaining momentum within literature circles. Higgins’ book of the same name, recently won the People’s Book Prize in the UK. In lieu of this increasing awareness of ecocide, there will be a mock ecocide trial on 30th September in the Supreme Court of the UK. This experiment will see a fictitious CEO, responsible for causing ecocide, taken to court and tried before a jury. The mock trial will be live streamed around the world and information packs and DVDs will be disseminated to schools, colleges, and universities in the UK. This is a day for everyone to engage with the debate, to ask questions about what ecocide is and to see what it would be like to have people prosecuted for environmental destruction. Should the environment suffer for the sake of profit? Who actually does this profit benefit? What does the natural environment mean to us? As a Crime Against Peace the criminalization of ecocide would also seek to end the inevitable warfare produced by resource scarcity. Sir David King, ex-chief scientific advisor to the UK government, warns that the 21st century is to be a century of resource wars, where we will be fighting for the last remaining resources, in particular water and oil. However, the illegality of ecocide would ensure we source our energy in an environmentally benign and sustainable fashion. Furthermore, if countries are encouraged to produce energy locally their energy security will be bolstered and they may avoid the conflict produced by resource depletion. The long-term hope is that such a legal framework at the international level can then filter down into national governments and local communities thereby ushering in and bolstering the new wave of ecological justice. Social and environmental responsibility need to guide business and not be an added bonus. The criminalization of ecocide will send out a global message: that across the board we do not accept the large-scale destruction of the environment. Some things must come before profit. Shell Case Echoes Call to Eradicate Ecocide by Robert Holtom is licensed under a Creative Commons Attribution-NonCommercial-ShareAlike 3.0 Unported License. Robert Holtom is the Campaigns Director for the Eradicating Ecocide campaign. He works alongside the barrister and international lawyer Polly Higgins to have the large-scale destruction of the environment recognized as a crime. Robert is a passionate advocate of a holistic form of earth governance that takes into account the rights of the whole earth community.